Harley did not propose to me at Mt. Pulag but in a similar setting; It happened in the romantic Highlands, at Inverness Scotland. I remember it was so cold that day. I had to wear layers of clothes. Too bad I did not own a Columbia pink rain jacket that time. It was also dramatically overcast. I could not see properly because it was drizzling. We too had that almost perfect Forevermore teleserye moment when he popped the question and I said yes. After I said yes I immediately told him I could not marry him right away. I had already renewed my contract and I had to continue working in the UK for another 1.5 years. I had to do it for myself, I reasoned. I felt the need to live on my own, alone in that beautiful country before settling down. He understood and told me he would wait. Okay we might not look like Xander and Agnes. Even if I will perm my hair, kahit digital perm pa. But we have our version of Forever; I have my forever with someone who loves me for who I am, flaws included. I am stuck with my Xander (who really looks more like Andrew), forrreevvverrr. But actually Forever requires a lot of hard work, of many things not going as planned. It is not as rosy as I had thought. Even now I am cradling our son, forever trying to finish this blog entry while simultaneously fending off his little hands from the keyboard. He also suspiciously smells like he just pooped. Though Forever is not always a walk in the park where beautiful autumn leaves have fallen, I am holding on to our version of Forever. 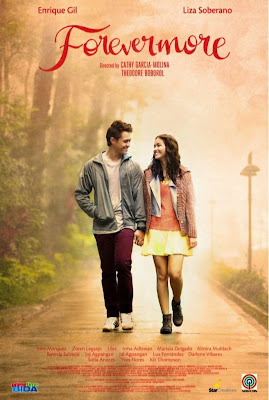 The Subido version of Forevermore? Nice story!